10 3/8 x 17 in. 17 x 12 3/4 in. Jill Newhouse Gallery presents 20 recent oil paintings on vellum by Gerard Mossé in his first solo exhibition since 2013. Mosse creates ethereal and evocative works fixated on light. The imagery is fundamentally abstract, comprised of deceptively simple shapes hovering in a neutral-toned, nondescript space. In the new works, dark monolithic forms are made to bulge dramatically by a band of burning white or yellow oil pigment, applied in multilayered rich impasto. Dark geometric shapes allude to boulders or earthen outcroppings, while the brilliant white bands are suggestive of the blazing sun, of moonbeams, a lighthouse beacon, or the primordial flame. 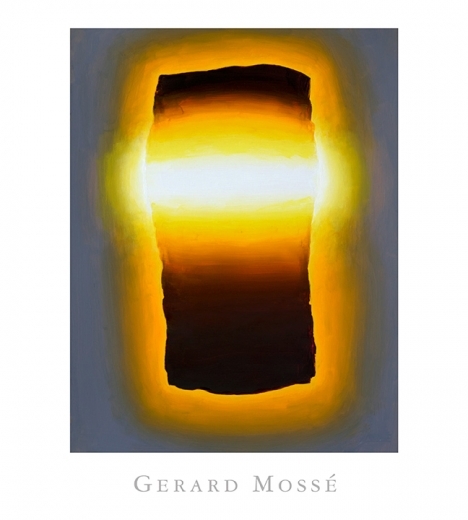 As pointed out by David Ebony, Gerard Mossé’s art rests on art-historical foundations. The glowing candles in the work of de la Tour and Richter immediately come to mind, as do the cosmic light sources in Baroque painting, such as Apollo’s radiant halo in the Velázquez’s 1630 masterpiece, Apollo in the Forge of Vulcan, in the Prado. French Impressionism and Post-Impressionism, especially works by Seurat, were among Mossé’s earliest passions, though his working method is more akin to Picasso's in the approach to art-making as an insular activity and a ritual process. Mosse’s paintings depict forms which cry out for description. Totem-like, sometimes anthropomorphic, but certainly architectonic, these images suggest the monoliths of Stonehenge burning with ethereal light. 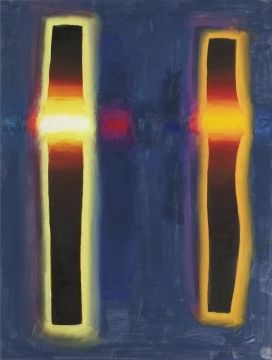 In the most recent works, such as Paper Painting E7 and Paper Painting F17, the brooding rectangular forms are tinged with color, and backlit, giving off a prismatic glow. The images-though unearthly-remain tethered to reality and to nature. 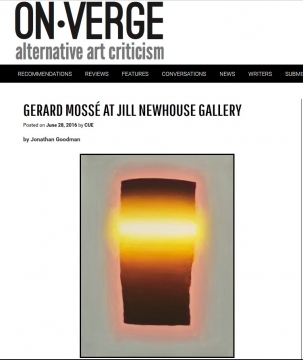 Mosse’s art exists in a singular realm, somewhere between the empirical and the mythological. Rather than a depiction of reflected light, Mossé’s spellbinding paintings do, indeed, appear to project light. They illuminate their surroundings, and bathe the viewer in a warm, sensuous radiance. The imagery is emphatic and the aftereffect never ends.